Join author and sensory evaluation expert Orietta Gianjorio for this very special book signing and honey tasting for children and adults! 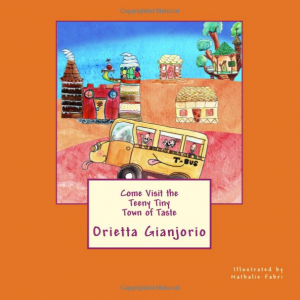 Orietta will be signing her children’s book Come Visit the Teeny Tiny Town of Taste, which follows the story of a group of taste buds as they discover the five basic tastes, including sweet, sour, bitter, salty, and umami. With a fun approach, Come Visit the Teeny Tiny Town of Taste helps children understand their capacity to look, smell, taste, and touch, which helps them develop a life-long appreciation for good food. Born in Rome, Italy, Orietta Gianjorio is a sensory evaluation expert who specializes in wine, olive oil, chocolate, and honey. As a Level 3 sommelier, certified olive oil taster, Level 2 chocolate taster, and certified expert in Honey Sensory Analysis, Orietta leads sensory evaluation classes and tastings around the country and educates consumers on quality standards. Her hope is to inspire people to look at food like a taster does: with love, curiosity, appreciation, and fun. *Admission to this event is FREE.